Displaying additional elements, such as a baseline or deadline marker, is usually done by creating a displayable layer and placing custom elements there (using the absolute positioning to put custom elements next to the related task). Returns either a DOM element that will be displayed, or false (the element for a task should be hidden). After you call the method, dhtmlxGantt adds a container to the timeline area. When dhtmlxGantt renders data, the addTaskLayer method will be called for each task and the returned DOM element will be appended to the container. For placing elements, you can use a usual absolute position. When a Gantt's task is updated, it will be updated in all layers including the custom ones (the function will be called for the updated task and the related DOM element will be replaced). dhtmlxGantt provides a method for calculating task's position and size - getTaskPosition. You can use it to calculate the position and size for your custom elements as well. To understand how to apply this functionality, let's consider an example: you have a planned and an actual time for tasks and need to display both of times. After that, you need to add additional data properties to the task object. Let's name them: 'planned_start' and 'planned_end'. dhtmlxGantt is aware just of the 'start_date' and 'end_date' data properties and automatically parse them to Date objects. Any other date properties require additional processing. To make the added 'planned_start', 'planned_end' properties recognizable by dhtmlxGantt, parse them to Date objects with the help of the parseDate() method in the onTaskLoading event handler. 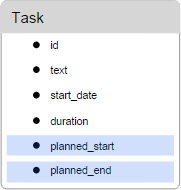 Then, call the addTaskLayer method to display planned time for task (defined by the 'planned_start' and 'planned_end' properties). Finally, redefine the lightbox structure if you want to provide a possibility to edit the newly added properties from UI. The full code of the considered example you can see in the related sample. 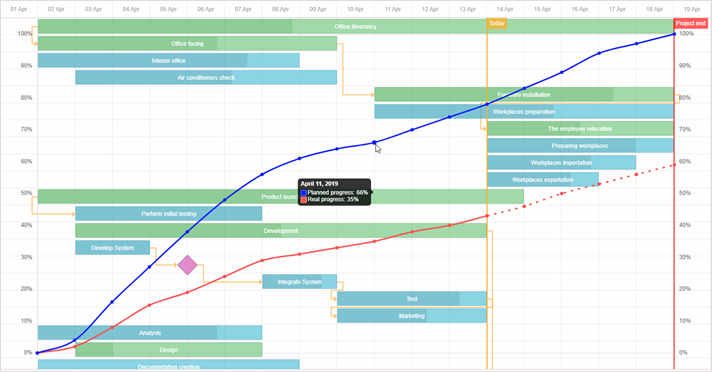 dhtmlxGantt provides the possibility to add an extra layer over the Gantt Chart for placing some custom content into it. As an overlay you can use a div container, an HTML canvas, etc. To draw the overlay content, any third-party library can be used. For example, you can add an S-curve into the extra overlay. Generally, S-curves display the growth of expenses, decrease of supplies of materials, etc., and allow tracking the common progress of implementing tasks of a project. use the addOverlay() method of the gantt.ext.overlay object and pass a function that contains the logic of adding overlay content into it. This function takes a container with custom content as a parameter. See examples below. The gantt.ext.overlay.addOverlay() method returns the id of a new overlay as a number. The dhtmlxgantt_overlay.js extension contains a set of API methods to simplify work with overlays. These methods are available via the gantt.ext.overlay object. adds a new overlay into the Gantt Chart and returns its id. Takes a container with custom content as a parameter. repaints the specified overlay. Takes the id of an overlay as a parameter. shows an overlay by its id. Takes the id of an overlay as a parameter. checks visibility of the specified overlay. Returns true if the overlay is visible.